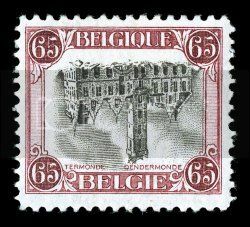 This famous rarity of Belgium - the only inverted center stamp of the country - is no exception. "The stamps went on sale August 5 (1920) as planned. Eight days later, a clerk at the Ghent Central Post Office began breaking up a sheet in the normal manner to sell individual stamps to customers. Nine stamps from this sheet were sold to a hotel bellhop. Several other customers purchased the 65c stamps and affixed them to letters. Then Hye de Crom purchased one of the Termonde stamps. He noticed something unusual about it. The Town Hall was upside down. The clerk had been selling stamps from a sheet with inverted centers without realizing it. Knowing the potential value of these major errors, de Crom returned to the window to buy more stamps from the sheet. He succeeded in purchasing 16 inverts in all - the last three rows of the sheet and a copy from the first row. The other copies of this remarkable error probably were used on mail and later destroyed. Two sheet of the first run had its centre inverted, so that the depicted town hall is upside down. Most likely the cause of this error was similar to the one of the Inverted Jenny, since the Belgian stamp has also two colours. The first sheet was partially sold in the Post Office of Ghent. After this discovery was made, the management of the Belgian Post went to Enschedé to find out if there were more. A second sheet was discovered, transported to Brussels and destroyed. One pane of the second run was also inverted. 50 copies of these were discovered in January 1921 in Leuven. They were confiscated by the Post Office before they could be sold to the general public. The remaining 50 were still in Holland and were cut, this being witnessed by Dutch and Belgian officials. The 50 already in Belgium were destroyed by burning them on 21 January 1921. 18 of the 25 stamps were sold at the Post Office of Gent (Fr. Gand) on 13 August 1920. When the discovery was made, only 7 copies remained. At the moment there are 17 known copies: 15 unused and 2 used. The only known cancellation is "Gand 13 August 1920". In 1942 a stampdealer from Brussels, who had two copies of the stamp, was murdered. The murderer and the two stamps were never found.